Filly 1 day old-out of Whalton Diva (Kilvington Scoundrel), by Hollyland Faytino (Small-Land Maytino). Above:Filly at 12 days by Hollyland Faytino out of Whalton Diva(Kilvington Scoundrel)-to make 14.2hh. Filly at 2 weeks out of Giorgione/ Donnerhall/Pik Bube mare. By Copybush Chiron. Above: Colt by Copybush Chiron out of Kilvington Scoundrel/Whalton High Falutin mare. Below: Filly foal born 28th May, pictured at 10 days. 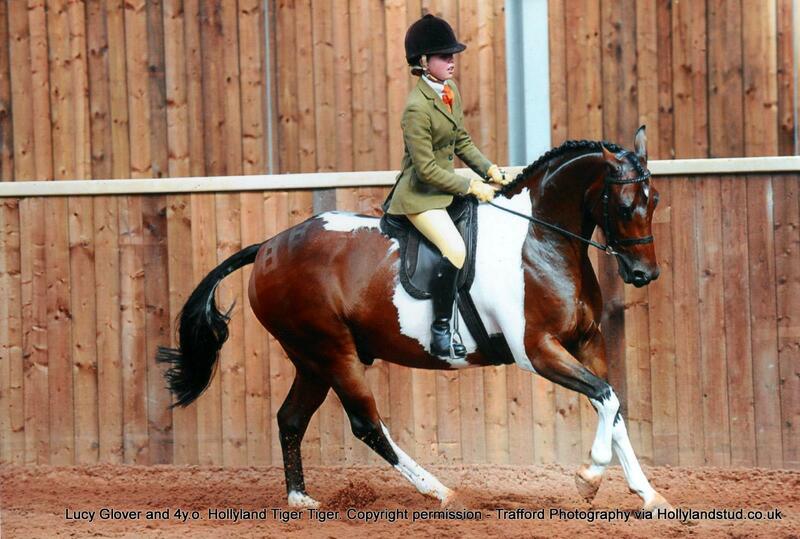 Dam: Copybush Eye of the Tiger,full sister to HOYS Creber Supreme , Copybush Catchphrase. 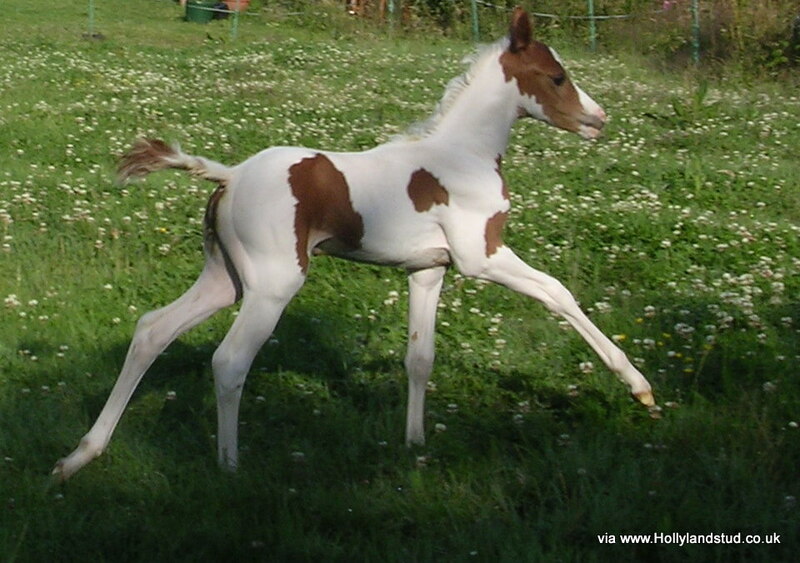 Sire Hollyland Cranberry (By Copybush Charlie Whisker out of a Small-Land Mambrino mare). Filly By Hollyland Cranberry out of Copybush Eye of the Tiger. Kazmars Turn Back Time by Jackets Indigo Blue. 2012 fillies by Copybush Chiron. Filly foal out of Whalton High Esteem, by Kilvington Scoundrel out of Whalton High Falutin. The first(right of picture above) is a 'catch-crop ' foal from a young mare who deserves to be shown in her own right under saddle.Highmead Flirtatious is By Llanarth Aristocat and out of Whalton Delightful. She is 14.2 and was bought because of her outstanding conformation and movement. Her bay and white colt foal is by Hollyland Cranberry who is by Copybush Chiron's brother and out of a Small-Land Mambrino mare. (Whalton Delightful due to foal at Chiddock Stud for 2014 to Chiddock Time Limit). 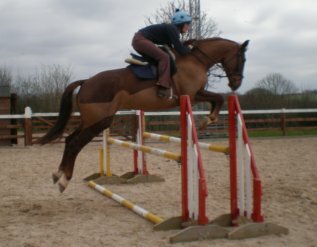 This lovely boy is eligible for Part-Bred Welsh and Part-Bred Arab classes aswell as Coloured. Copybush Eye of the Tiger, full sister to HOYS Supreme In Hand '94, Copybush Catchphrase, has produced a dark coloured foal by Hollyland Cranberry. Above at 6 days, below at nearly 2 months. Below: By Copybush Chiron and out of Whalton Diva. and out of a Pascal(Pik Bube)/Friesian/TB mare. 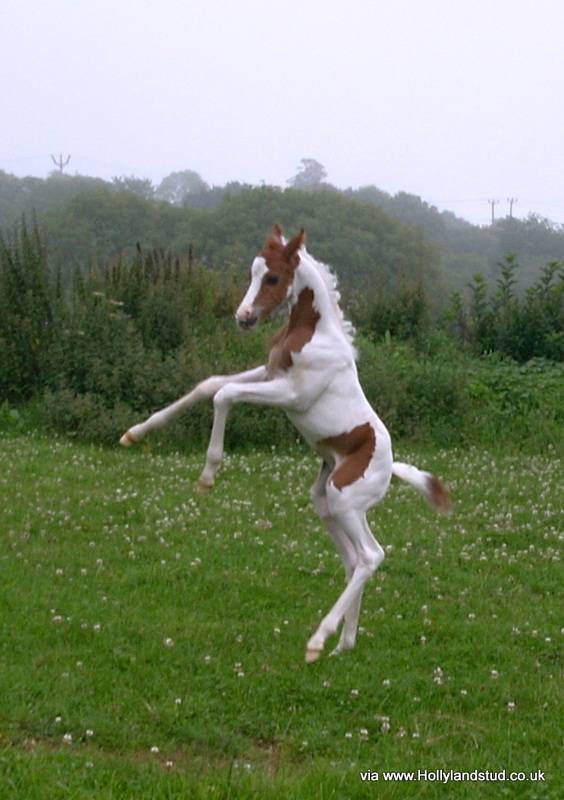 This foal owned and bred by the Ross family. These colts have the quality, conformation and movement to be expected from their breeding. 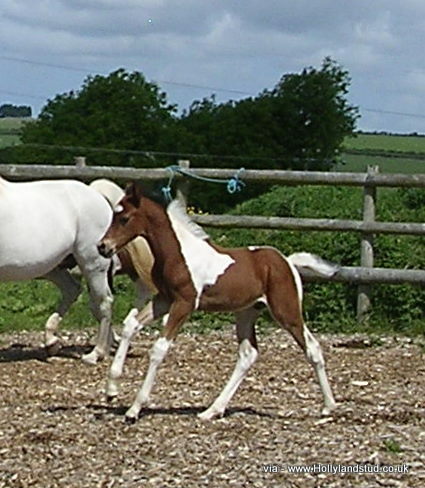 Sarnau Valentina with Hollyland Venus (by Copybush Chiron) as a foal. 2010- Hollyland Venus and Hollyland Faytino foal. Colt foal by Hollyland Faytino (Small-Land Maytino) and out of Hollyland Venus. 2009 out of Kazmars Turn Back Time-another lovely filly who moves on air. Picture above at nearly 3 weeks. Copybush Eye of the Tiger-by Trellech Courvoisier out of Carolina Cat's Eye (Rosslyn Sandalwood). Eye of the Tiger is full sister to '94 HOYS In Hand Champion, Copybush Catchphrase. In 2008,Tiger has another upstanding, scopey, extravagant moving foal. This year he is virtually bay(though genetically coloured) with stockings and a star on his shoulder. Kazmars Turn Back Time-by Jackets Indigo Blue out of Jackets Classic Times has a remarkably outgoing filly(2008). This lovely mare, the image of her father is by Small-Land Mambrino out of Winton Qumay. Quizzy, as she is known, has bred outstanding foals, including the stallion Copybush Dancemaster, Copybush Quiznight, Copybush Quizzing Glass, Copybush Quiztime, Copybush Quizz Kid. With us, she has bred Hollyland Quincy, Hollyland Quintino and Hollyland Quiz King. Pictures of some of Quadrille's offspring in the Gallery. 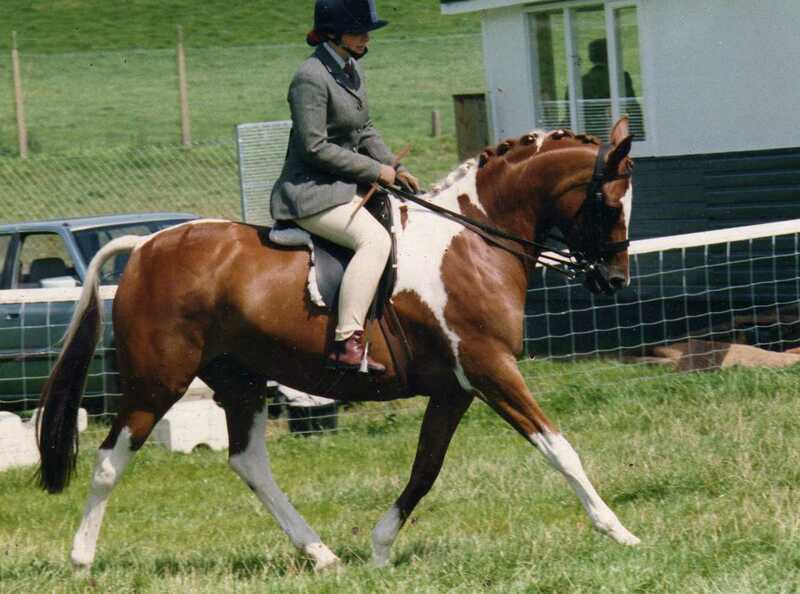 Copybush Quiznight...(below)Sire Copybush Catchphrase(HOYS Supreme In Hand '94) Dam Copybush Quadrille. Hollyland Passing Cloud-by Pascal out of Solva Cocktail. With foal Hollyland Peach. Cloud is now at Tullynessle Stud as is her son, Hollyland O'Donovan. 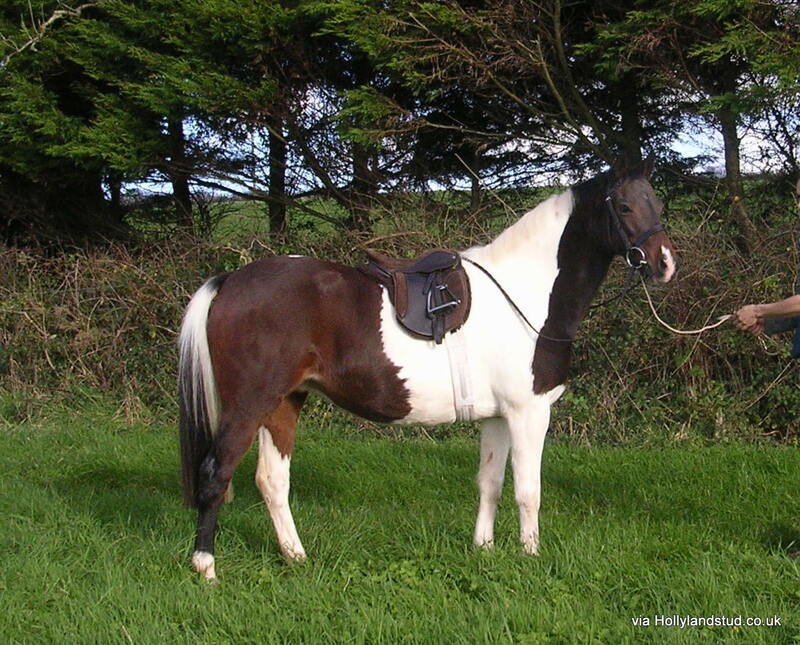 O'Donovan is sired by the Donnerhall stallion , Donnersohn. Cloud is a full sister to Hollyland Pacific. Hollyland Peach-with 2007 foal by Hollyland Faytino. Copybush Eye of the Tiger and day-old 2007 foal. Below, 2007 foal as a 4 yo. Solva Cocktail came to us as a yearling to be stored for Genti as a 14 hander. She was bred by Beryl Alcock who also bred her mother Solva Cherie. Cocktail was shown and Pony Clubbed by Genti as a young mare. 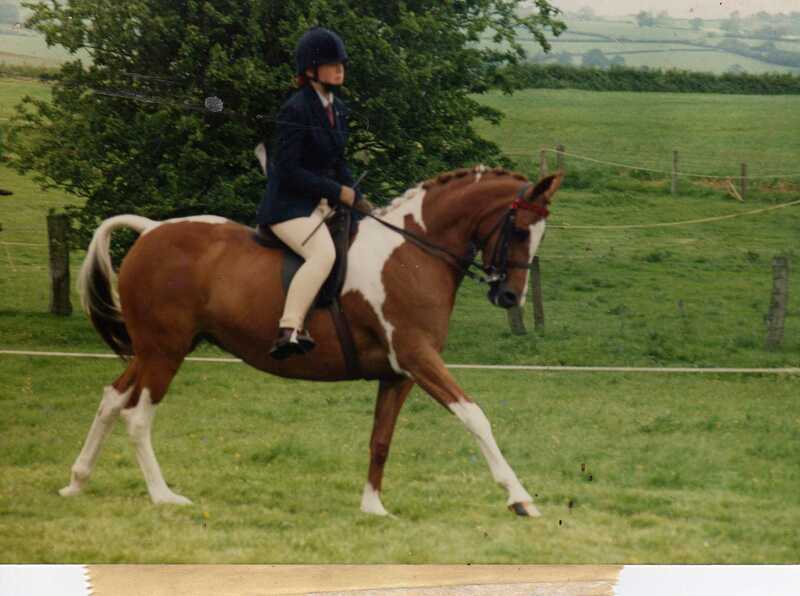 She was virtually unbeaten in coloured classes and held her own in BSPS, PBA and PBW classes too.At five she was Supreme Champion at CHAPS SW.
Hollyland Moonbeam- LR /1st ridden-pictured as a foal. Hollyland Moonbeam is a daughter of Litton Talisman mare, Hollyland Moonpenny. 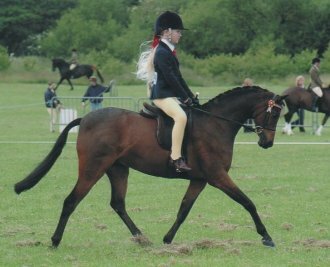 H.Moonpenny is dam of Copybush Moonsprite, winner of her First Ridden class and Champioship at Royal Windsor 2010 aswell as other top-level wins . 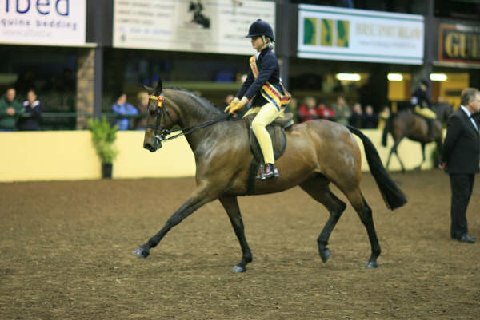 She finished the season with winning the First Ridden class and Championship at HOYS 2010 . We feel that this grey 2008 filly, out of Copybush Moonsprite's half-sister and by the fabulous Small-Land Extra Time is special, too and should make a top LR or First Ridden. ...more profiles and pictures to be added. *Outstandingly well-bred Head Stud Book Graded Oldenburg mare. 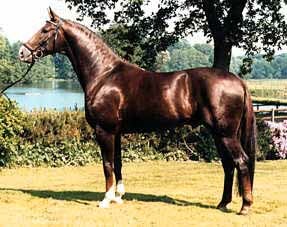 Sire Giorgione, Dam by Donnerhall and out of a Pik Bube mare. 7 years , 16.1hh approx. This lovely girl was bought as a three year old with the intention of Genti bringing her on and enjoying her.She was graded in the Autumn of her 3rd year with the Oldenburg Society.Head Stud Book -as all the dam line. She has been brought along slowly. Professionally schooled in 2008 after Genti's first baby was born. Now with another coming along , it will be such a waste to just turn her out . 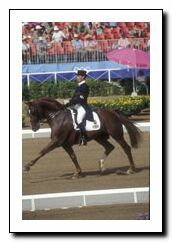 Last year, she had an introduction to competing in both dressage and show jumping. Emphasis was on developing technique and laying good foundations. Particularly kind and obliging, she is not mareish. Easy to do in all ways.